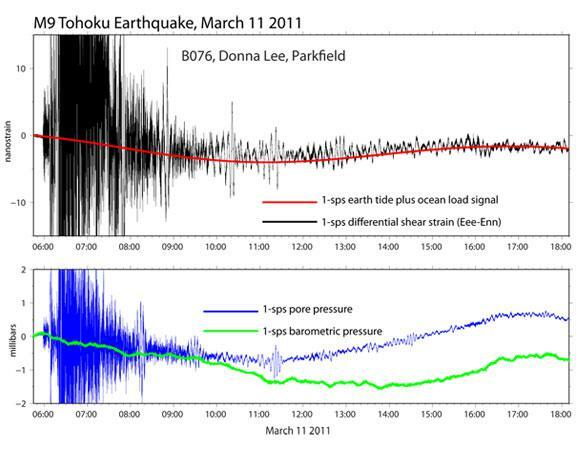 Beginning October 2011, UNAVCO will start releasing high-rate (1-sps) processed borehole strainmeter data for geophysical events of special interest, e.g., earthquakes, tsunamis, volcanic events or in response to community requests. The high rate strain data set will include areal and shear strain, earth tide plus ocean load time-series, barometric pressure corrections, plus pore pressure and tiltmeter data if they are collected at the site. These new data products will be available from the UNAVCO PBO web page under the Geophysical Event section. The first high rate data sets available are for the M9, March 11, 2011, Tohoku Earthquake and the M6.4, 2011 September 9, Vancouver Island Earthquake. The Plate Boundary Observatory includes 75 borehole strainmeters installed in targeted arrays along the western US Plate Boundary. The purpose of the instruments within the Observatory is to capture short-term strain transients that fall between the detection levels of GPS and seismology. Since the installation of the first strainmeter in June 2005 the instruments have recorded Episodic Tremor and Slip Events, coseismic offsets, aseismic creep events, tsunamis and volcanic strain. This new strain product is provided for groups who are interested in studying strain transients with periods of minutes out to hours or comparing strain signals with seismic, high-rate GPS or meteorological data sets.